The third video of the second week the class* is about the history of the “Third Wave of Kabbalah” including the Sabbatai Zevi, Luzzatto and the Hasidic movement. 1. The radical, heretical Sabbatean movement in the 17th century he was a mystical messiah, he broke with the traditional normative Jewish codes , maybe going against the law sometimes in sexual areas and other areas. He goes through psychic suffering; he goes to a diagnostician, Nathan of Gaza, who says you’re the messiah; with the suffering of a messiah inside your own soul. 3. Rabbi Shalom Sharabi, aka the Rashash, in Jerusalem in the 18th century. 4. Rabbi Moshe Hayyim Luzzatto, Italian Kabbalist of northern Italy in 18th century. 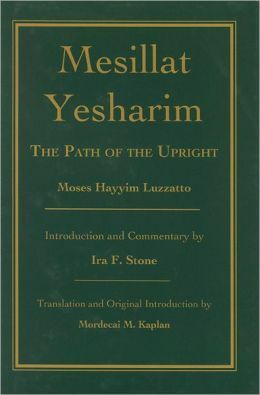 Look at Mesilat Yesharim, because it’s really a classic. 5. The Hasidic movement, the most researched, the most popular known movement, popularized by, Martin Buber. The Hassidic movement really wants to turn Kabbalah into a social movement; it takes over 50% of big parts of the Eastern European world in a matter of 20 years in Eastern Central Europe. The Vilna Gaon, Kremer, he excommunicates the Hasidim. However, it doesn’t work. The rebbes, the mystics, and mystical psychologists, have charisma, the power/ability to diagnose,. Hmm, I never considered the Vilna Gaon much of a Kabbalist. Maybe I was tainted by the countless volumes I read by Martin Buber. At this point the errors in transcript/subtitles of the videos become funny: Martin Buber becomes “Martin Bubba”, the rebbes become “The Webbers”, Isaiah Tishby becomes “Shaol Tushbi”. I wish the TA or the professor had time to read and correct the transcripts. Otheriwse I enjoyed the summary of a period I am more familiar with. * This blog entry is part of my series on Professor Jonathan Garb’s“Modern European Mysticism and Psychological Thought” course I am taking at Coursera.